When the father of Jessie Duff introduced her to competitive shooting, he was just sharing his love of competition and firearms. There was no way he could have known Jessie would turn a hobby into a full time career and become a professional athlete, but that’s exactly what happened. 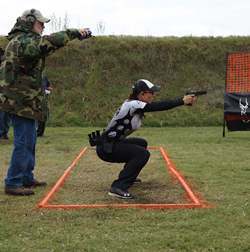 In the thirteen years since she began her career, Duff has broadened her repertoire and competes in the USPSA (United States Practical Shooting Association), Steel Challenge (World Speed Shooting Championships), NRA Action Pistol or Bianchi Cup and Multi-gun disciplines. Of course, this is just the beginning for Duff. With over fifty National and World titles standing proudly behind her, she is perfectly placed to be a role model for our next generation of shooters. To read more articles from Western Shooting Horse, visit www.westernshootinghorse.com. Photos provided by Western Shooting Horse.